I love knitting books. Especially knitting books with stunning natural photography. I must admit, I rarely read knitting books for their content and only buy them for their visual art. This probably explains why I rarely make anything from a pattern. All my designs are knit individually based on body measurements. When I start a knitting project, I see the end result as a photograph in my mind. The color, the texture, the drape are all thought out before I begin. As I move through the piece, I'm not concerned about the exact right number of stitches or how many rows to the inch I have, but whether it looks proportionately beautiful. If I can lay it out and see that the composition of the garment is precise, I have succeeded and it will fit perfectly every time. That being said, I have read five knitting books that I would recommend every literate human own. 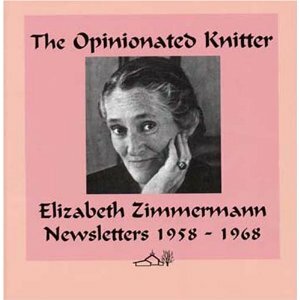 Complete with personal photographs, they are all authored by the free~thinking, opinionated knitter, Elizabeth Zimmermann. If you are a knitter, then you know what I'm talking about and I need go no further. If you are not, read them anyway. She writes like a personal diary, recounting her fantastic travels and adventures as a child all the way through adulthood. Her humor and wit are engaging and will remind you to be confident in your abilities ~ whatever they may be.